Buyi Zama has played Rafiki in The Lion King for 16 years. Buyi Zama was no stranger to big stages before she first landed a gig in a London production of The Lion King. A singer since childhood, she'd grown into a gospel powerhouse in her native South Africa, working as a backup singer to some of the genre's stars, recording in London and touring throughout her homeland. She even once shared a stage with Whitney Houston on the pop star's only tour of Zama's country. Zama's move from concert stage to one of the most successful Broadway musicals of all time, though, was less a natural progression of career ambition than just pure dumb luck. Zama traveled with her friend to Johannesburg so her friend could audition for the London show. A casting director asked Zama to sing a bit while she was waiting for her pal, and four days later she got an offer to join the London cast in the role of Rafiki. The colorful mandrill is a spiritual guide of sorts in The Lion King, appearing in times of joy and trouble and acting as a go-between for the audience and the action on stage. Zama took the job even though she had no acting experience. More surprisingly, she had never seen The Lion King — the musical or the Disney movie it's based on. She immediately ran out and rented a VHS copy to watch. "I was in my mind going, 'Oh my God, how are we going to do this?'" Zama recalls, talking from a Seattle stop of the touring production of The Lion King now heading to Spokane. "I was making up in my mind how we were going to do it. I was looking at the movie and taking it to the stage in my head: 'How is this going to work? Are there going to be animals running everywhere?' But the music itself was soothing to me, and it made me feel like it was OK to go away from South Africa because the music was going to make me feel like I was at home all the time." It's a good thing Zama was so attracted to the music and the songs penned by Elton John and Tim Rice that fill the movie and musical, because she was about to spend much of her adult life with them. Zama's been on the road almost nonstop with touring productions of The Lion King for the past 16 years. As Rafiki, she brings a comedic jolt and serious voice to the story of young lion Simba and his efforts to take over the throne of his fallen father Mufasa, who'd been stabbed in the back by his own brother (and Simba's uncle) Scar. While she feels like she's grown into the role through the years, as she's grown closer in real life to the age of her character, Zama says the early stages of life in the show were "scary." "I didn't know much about theater, and I always thought, 'Oh God, they can tell,'" Zama says. "But now I really feel comfortable and I go out there and I just want to share. Maybe I just didn't see what they saw in me, that whole creative team at the time. I knew I could sing ... but this whole acting business, I didn't go to school for acting. I had never acted before, but they saw something." What they saw has led Zama to a dreamy life for someone who was obsessed with travel well before she joined the cast of barnstorming creatures. Not only has she performed in London and in the Broadway production, but in touring versions that have taken her to Australia, Europe, Japan, China and beyond. Zama's current trip across the United States includes a new addition, her seven-week-old baby, as well as her husband to help manage life as both a performer and new mother. Zama says she doesn't get out to explore the cities The Lion King visits as much this tour as in the past, but she's trying to make a point of taking a family photo at a noteworthy landmark in each stop (so keep an eye out for "Rafiki" at the Riverfront Park Red Wagon). Since returning to the show in November after maternity leave, Zama also finds herself reflecting on The Lion King's themes in new ways. In part that's due to the new role in her life, but it's something she's always done during her nearly two decades playing Rafiki. "I get different things at different times out of the show, it just depends what I'm going through in my life at that moment," Zama says. "There will be something that will just pop up and I'll hear it for the first time because of where my brain is, or because of something I'm going through or something someone I know is going through. "There's a line that Mufasa says that's just, 'Remember who you are.' That always makes me think and remember I'm a good person, I'm kind, I'm loving, I am loved. I remind myself of these things that are good and it makes me feel good." More than 95 million people have gone to see one of 25 global productions of The Lion King. The Lion King has been performed in nine languages: Japanese, German, Korean, French, Dutch, Spanish, Mandarin, Portuguese, English. The Lion King has played more than 100 cities in 20 countries, on every continent except Antarctica. 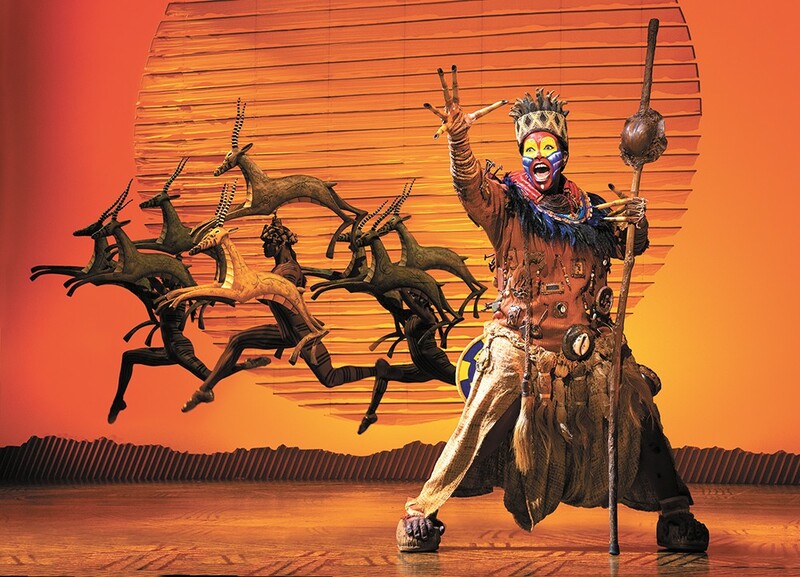 The Lion King won six Tony Awards in 1998, including Best Musical, Best Scenic Design, Best Costume Design, Best Lighting Design, Best Choreography and Best Direction of a Musical. The Lion King musical has been running on Broadway since 1997, and grossed more than $1 billion on Broadway and more than $8 billion globally. A new Lion King movie, directed by Jon Favreau (Elf, Iron Man, The Junge Book), is set for release on July 19, 2019. The original print version of this article was headlined "At Home on the Road"